Chicago Maroon: When did you start playing volleyball? Nikki DelZenero: I started playing volleyball when I was in seventh grade, so I was 12. CM: Did you play other sports beforehand, or at the same time? ND: I played softball from ages eight to 16. During my freshman and sophomore year of high school I played both softball and volleyball, and then had to give up softball because I was playing volleyball year-round, and it got to be way too much to try and balance. CM: When did you know you’d play in college? ND: I knew that I wanted to play in college my sophomore year of high school. It was kind of the first year that it occurred to me as being a thing, when I was on the varsity team as a sophomore. I switched clubs into a more competitive one that could help me with recruiting, and so that was when I first kind of made the move towards that direction. CM: You’ve been playing since you were young, and you’ve played here now. 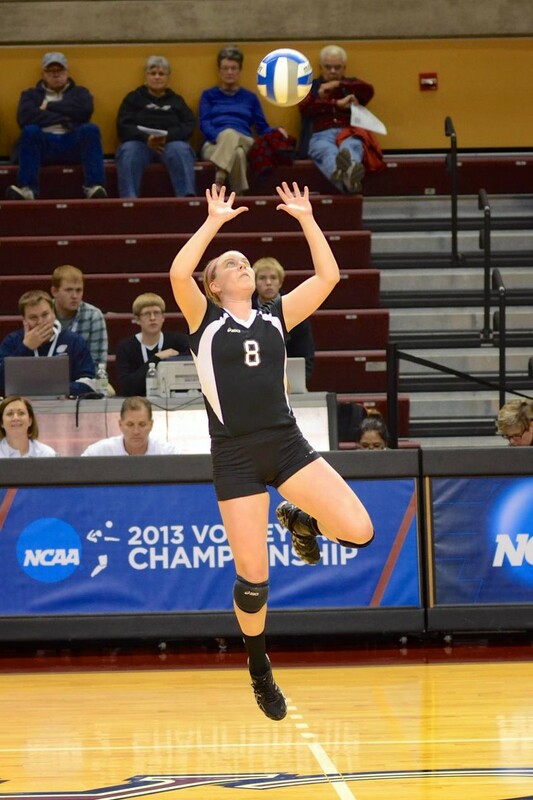 How do you think you’re going to continue with volleyball after you graduate? ND: I definitely think that coaching is going to be a part of my life in some capacity. Right now I am a setter’s coach—a positional coach—for a travel club team in the area. They’re nice because a lot of the travel teams in the area are in the suburbs, and they take a lot of the city kids. And I’m hoping that if I end up in the city after graduation at some point, I will be able to have my own team, instead of just being a positional coach. And then coach every weekend, or every other weekend, with my own team instead of just once a week for random girls who play my position specifically. I’ve definitely given thought to going to graduate school and being a graduate assistant at a program, be it at Emory in our own UAA, because I think I have a lot of good DIII knowledge, or going somewhere that’s a big DI school where I can learn even more from a coach who has had a fantastic DI team in the Sweet Sixteen or the Elite Eight a few years. So, I’ve given thought to that, but I think that I want to look into that more in a couple years. That’s kind of the coaching route. The other route is the playing route: There is opportunity to play volleyball professionally in Europe, but the information about how to do that and how to get there and how to get coaches to see you—there are just a few people in the United States who are the gatekeepers of that information, so I’ve been doing research and trying to figure out if it’s plausible. Those tryouts are in September, or in the early fall, so it’s something that’s a bit on the back burner for now, because I try to get the rest of my life figured out. But it’s something that’s occurred to me and that I would really like to do. CM: The same way that you realized in your sophomore year of high school that you wanted to play in college, was there a point in the last four years when you realized that this was something you wanted to interact with after graduating? ND: I think sophomore or junior year of college, when I realized that there is an end point on my saying, “What can I work on for next season?” That number of seasons I have left playing competitively with a jersey on my back, with a group of people who are willing to come into the gym and work towards the same goals every single day, that was dwindling. CM: What’s on your mind when you’re playing? ND: I got really lucky that in seventh grade, my coach decided to put me in the setter’s position, because I think 100 miles a minute. And I talk that fast, oftentimes. And my position is one of few where that’s not only allowed, but kind of encouraged. And the best players who set are able to think and do a lot of things at one time. Because I’ve had so much practice in real life, I’m able to do it without feeling or looking frazzled, just my mind can be running around a lot. I, especially in the last couple of years, tried to improve at both thinking about what was happening on my side of the net and the other side of the net, too, which is kind of a dual-minded thing to be thinking about. I’m always thinking about what I need to do to continue the game and to focus on my skill. But I also need to think about how each of my teammates is reacting and performing and how what I do to them or in what way I give them the ball, or what I say to them after I give them the ball, affects them individually. And then at the same time, I have to be thinking about what patterns are happening on the other end of the net and how my decisions are affecting their decisions and their actions and their movements.